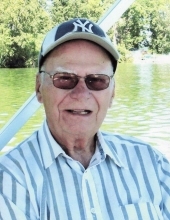 Mr. Orville J. Ehaney, of Port Washington, passed away Thursday morning, July 21, 2016 at Harbor Club. He was 88 years old. Orville was born on May 14, 1928 in Port Washington. In 1945, Orville enlisted in the United States Navy where he earned the rank of Chief Petty Officer. He served during the Korean War and was honorably discharged in 1958. On April 23, 1960, he was united in marriage to Irene Depies at St. Mary’s Catholic Church in Port Washington. The couple resided in Port Washington where they raised five children. Orville enjoyed being outdoors especially walking around the neighborhood and reading the paper outside. He also was an avid lottery ticket player and Yankees fan. He participated in the St. Peter’s Choir and Men’s Club as well as volunteered for Fish day. Above all, Orville loved being around the company of his family. Orville is survived by his five children: Scott (Lisa) Ehaney of Fredonia, Sue (Jerry) Wenszell of Milwaukee, Denise Mondloch (Ed Ramberger) of Denver NC, Pam (Jay) BonoAnno of Deforest and Debbie (Tom) Doig of West Bend. He is further survived by 20 grandchildren; his brother-in-law Richard Depies of Dacada, two sisters-in-law, Grace Rollinger of Belgium and MaryAnn Lanser of Port Washington, nieces, nephews, other relatives and friends. He was preceded in death by his wife Irene, sister Audrey Pfister and brother Melvin (June) Ehaney; four brothers-in-law; Nicholas, Leroy, Oliver and Reinold. A Mass of Christian Burial will be held at 6PM on Tuesday, August 2nd, 2016 at St. John XXIII Parish (formerly St. Peter’s Catholic Church), 1800 N. Wisconsin St. in Port Washington. Father Patrick Wendt will preside. The family will receive visitors at the church on Tuesday from 4-6PM. Orville will be entombed with his wife Irene at St. Mary’s Mausoleum, Port Washington. In lieu of flowers, memorials are appreciated to Port Catholic School. On-line condolences may be left at www.eernissefuneralhome.com . To send flowers or a remembrance gift to the family of Orville Joseph Ehaney, please visit our Tribute Store. "Email Address" would like to share the life celebration of Orville Joseph Ehaney. Click on the "link" to go to share a favorite memory or leave a condolence message for the family.